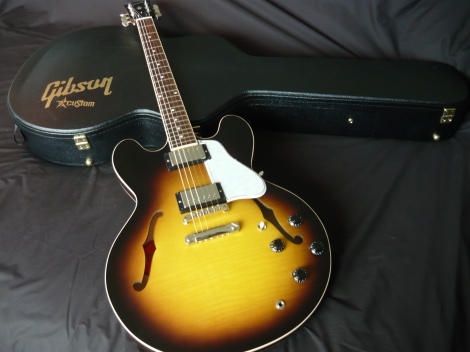 2012 GIBSON ES335 DOT FIGURED GLOSS - VINTAGE SUNBURST. Slightly used, 100% mint, NOT a demo in a retail store. Right from its introduction in 1958 as the world's first semi-hollowbody electric guitar it has been a mainstay of players eager to balance the gorgeous, round, mellow tones perfect for jazz and blues with the edge and sustain of a full-blooded solidbody. Powerful '57 Classic humbucking pickups, two volume pots, two tone pots, and a three-way pickup selector switch. The neck is one-piece mahogany beneath a 22-fret rosewood fingerboard with pearloid inlays and a single-ply binding. Additionally, there's single-ply binding on the top and back. Includes Custom Shop Certificate of Authenticity and Genuine Gibson Levant Case.